Note: Full source code for the example can be downloaded here. One of the many things you don’t often do with PHP (actually, I’m not sure you do this much with any language) is daemonize a process. A daemon is program that runs in the background (read more here). On Unix systems, processes are usually created by forking the init process and then manipulating the process to your liking. To create a daemon though, you need to get the init process to adopt your process. To do that, as soon as you fork the parent process, you kill the parent. Since you child process is parent-less, the init process generally adopts it. Once that happens, your process has been daemonized. In order to follow the example, you’ll probably want to read up on multi–processing in PHP and using POSIX in PHP. Aside from that, keep an open mind. There are probably better ways to do this (Nanoserv), but I think that doing it manually is a great way to learn more about systems programming and PHP. The first thing that you need to do when daemonizing a process in PHP is fork the process. After that, we promptly kill the parent process so that the child process can be adopted. //Check to make sure the forked ok.
//This is the parent process. //We're now in the child process. Now that we have successfully forked the process and killed the parent, we need to detach the process from the terminal window. We do this so that when the terminal window closes, our process doesn’t close with it. Once that’s done, we get our processes’ id. //Get out process id now that we've detached from the window. Now that we have our processes’ id, we need to let the system know about it. To do this, we create a file in /var/run. This file can be named anything you want, just make sure that it’s unique and it ends with the .pid extension. In that file, we place the pid of our process and that’s it. //Create a new file with the process id in it. Now that all the hard stuff is done, you can get to work. What do you want your process to do? For this example, I have mine adding 1 + 1 every 10 seconds. Nothing too difficult, but you can make your process do whatever you like. For instance, you could set up a server of some sort. Note that this the code is sitting in an infinite while loop. This is done so that the process doesn’t exit naturally. 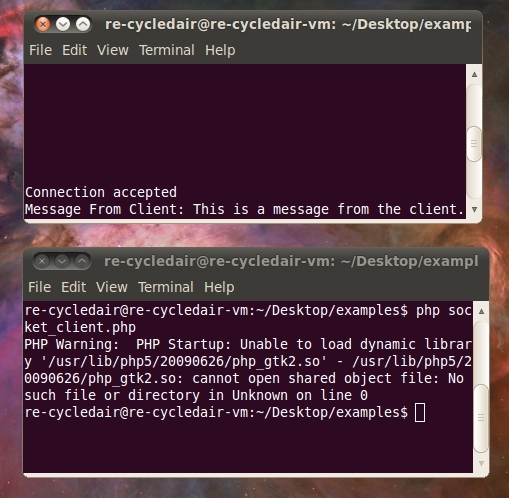 To run this process as a daemon, all you need to do is save you file and run php <myfile>.php. You may need to execute it as a super user depending on how you permissions are set up. Once it’s run, you can check out the results of your hard work by running ps aux | less. Scroll to the bottom and your process should be there. In the screen shot below, mine is 3rd from the bottom. Did you like this article? Check out the rest of the Dark Arts. Note: The examples mentioned in this article have source code available here. PHP is not meant for desktop graphics programming. It just isn’t. PHP is web development language, or as you’ve seen in the PHP Dark Arts series, it can be used for some non-web related purposes. But using PHP for GUI development just isn’t something people do, so naturally I had to give it a shot. After much Google-fu I cam across the PHP-GTK project. The first question that I had when I started looking at PHP-GTK was “What can I do with this?”. Simple GUIs are very possible with PHP-GTK. For example, you could easily build a questionnaire, a calculator, some sort of text editor, maybe a music library manager. In short, you can build simple desktop applications. 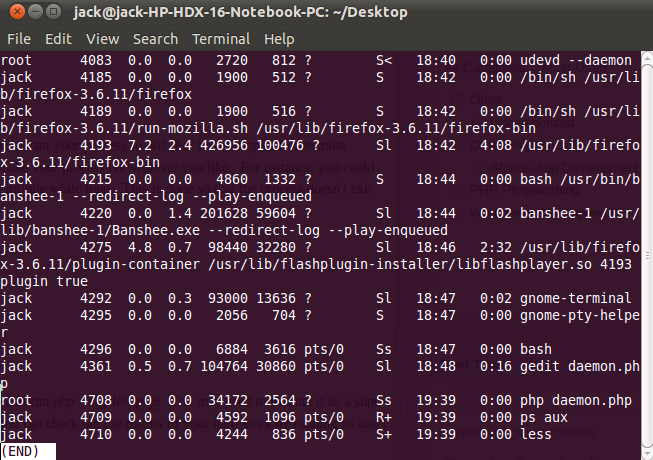 Getting PHP-GTK is easy. Making it work for you is another matter. I had originally hoped to get it running on my Ubuntu 9.10 virtual machine that I do all of my Re-CycledAir development work on, but that just wasn’t working for me. I kept running into dependency issues and it just wouldn’t compile right. After much pain and suffering I decided to just use the pre-compiled Windows binary which worked like a charm. If you plan to follow any of these tutorials, I highly recommend that you use the Windows binary. Once you have the Windows binary installed, just execute your GUI PHP programs using <path/to/phpgtk/>php.exe your_file.php. When I learn something new, be it a language or a library, I always like to start off with a simple “Hello World” program. What follows is a simple “Hello World” program that creates a small window and displays some text. //is what allows the program to exit fully. //add it to the window. If everything goes correctly, you should get something that looks like this. In this example, we place a button on this window instead of a label, which then triggers a modal pop-up window with a message. //Check to see if PHP-GTK has been loaded correctly. //Create a new window and set it's title to "Hello Re-CycledAir". //then add it to the window. "You have received this message: \r\n"
. "<span>" . $message . "</span>"
I am by no means a good GUI programmer. In fact, the only GUI programming I have done outside of these examples is building a few simple interfaces using Swing in Java. Your mileage may vary, but I found PHP-GTK to be a bit clumsy in how it handles things. Perhaps with some more development time it could become a better library, but generally there are much better languages and libraries out there for GUI development. Did you like this article? You’ll probably like these too. Note: The full source code for the examples can be downloaded here. In my previous articles on using PHP for multi-process programming, we kept it very simple. By simple, I mean we didn’t have any inter-process communication (IPC). IPC is a set of techniques for the exchange of data amongst separate processes and/or threads. There are many different ways to set up IPC, such as files, signals, sockets, pipes, semaphores, shared memory, and message passing. This time around, we’re going to cover PHP’s implementation of shared memory segments. So what does it mean to share a memory segment? It means that the program will create a section of memory that can be accessed by other processes on the system. Normally this isn’t the case, since most processes have mutually exclusive address spaces. The benefit of using a shared memory segment is that communication between processes is extremely fast. The main downside is that processes must be running on the same machine (and same processor in some cases), where as other types of IPC can be used over a network. In order to share memory between processes, you first need to create the shared memory segment. This is accomplished with PHP’s shm_attach() function. The shm_attach() function takes 3 parameters. $key (int) – This is an integer value that identifies your shared memory segment. If you used 123456 for this value in one process, you would need to use the same key in another process to access the shared memory segment. $memsize (int) – This is the amount of memory (in bytes) you would like to share. Deciding how large this should be is sort of a pain. The easiest way it to simply pick an arbitrary amount and make sure anything you try to share isn’t larger then that. The best way would be to know the maximum size of data you will need to share and set it to that value. $perm (int) – The permissions for the shared memory segment. These permissions follow typical Unix style permissions. The default is 0666 which means that everyone can read from and write to this memory segment. On success, shm_attach() returns an identifier of the shared memory segment. //Define shared memory segment properties. //Create or open the shared memory segment. The shared memory segment key. An integer used basically as an index on the data (making it easier to retrieve). Some variable. This can be anything so long as it’s smaller than the size you’ve defined the memory segment to be. The shm_get_var() function is very similar. It only takes 2 parameters, one of which is the key for the shared memory segment, and the other is the integer value (index) associated with the stored data. Now that you know what the functions do, let’s put it all together in a little program. //Handle operations for the segment. <->php shared_memory.php send 1 "Hello. This is the shared memory segment." Message sent to shared memory segment. Received data: Hello. This is the shared memory segment. Shared memory segment content deleted. You’ll also notice that at the end I delete the contents of the shared memory segment. It’s important to understand the difference between detaching and deleting(removing) here. When you detach the shared memory segment, it’s possible for your data to still exist in memory until it’s overwritten by something else. This poses a big security threat, so you should always delete(remove) the data first. So how do we release the memory? By using the shm_detach() function. Now that your done, check out the full source code for the examples here. In the near future I hope to have a virtual machine available for download, so users who don’t want to mess with configuration can just start it up and go.